Eaton 3-Pole 1-/3-Phase Full voltage non-reversing IEC contactor has coil voltage rating of 110 - 120-Volt AC. It has 1 NO - 1 NC contact configuration. This 90-mm frame G contactor has screw terminal connection and supports panel/DIN rail mounting. It has a maximum load capacity of 10 hp at 115-Volts, 25 hp at 200-Volts, 30 hp at 230-Volts for 1-Phase and 40 hp at 200-Volts, 60 hp at 230-Volts, 125 hp at 400/575-Volts for 3-Phase. The IP20 rated open enclosure offers maximum degree of protection. It has a dimension of 111-Inch x 160-Inch x 170-Inch. Contactor has operating temperature rating of -25 to 50 deg C and storage temperature rating of - 40 to 80 deg C. It is specifically designed to offer highly effective control and protection for a variety of loads, including motors, compressors, pumps, resistive, capacitor banks and isolation. 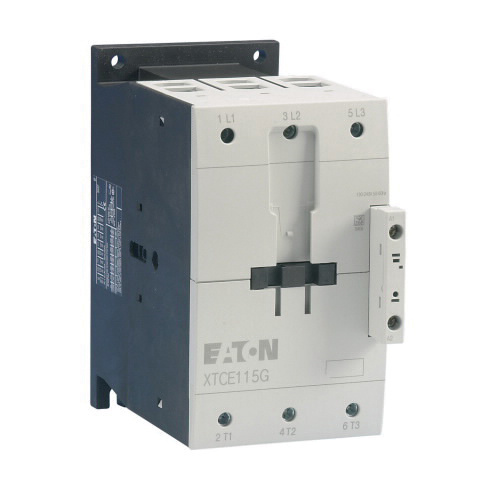 IEC contactor is UL listed, CE/CSA/IEC 60947 certified, RoHS compliant and meets EN 60947 standards.